Free performance by Clyde Wheatley! 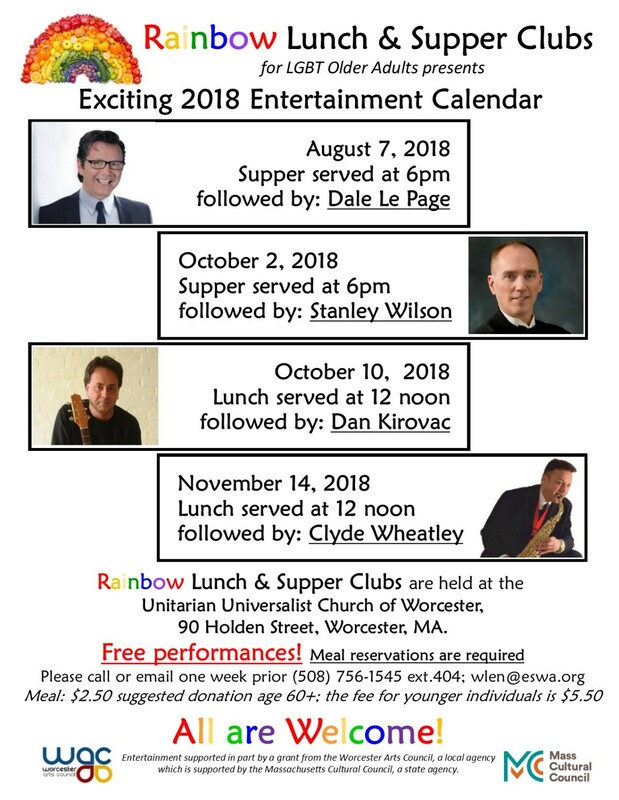 The Rainbow Lunch Club meets the 2nd & 4th Wednesdays of each month and offers LGBTIQA seniors age 60+ a nutritious meal and an opportunity to socialize with friends and enjoy various activities including programs, entertainment and educational series. Advance reservations are required. Please call or email by the previous Wednesday: (508)756-1545 ext.404 or wlen@eswa.org All are Welcome: LGBTIQA 60 years old and older; younger partners, friends, and allies. which is supported by the Massachusetts Cultural Council, a state agency.